Flowers are in bloom. The temperature is warming up. It’s perfect weather to go outside. But you know what? Let’s stay indoors and watch some anime. 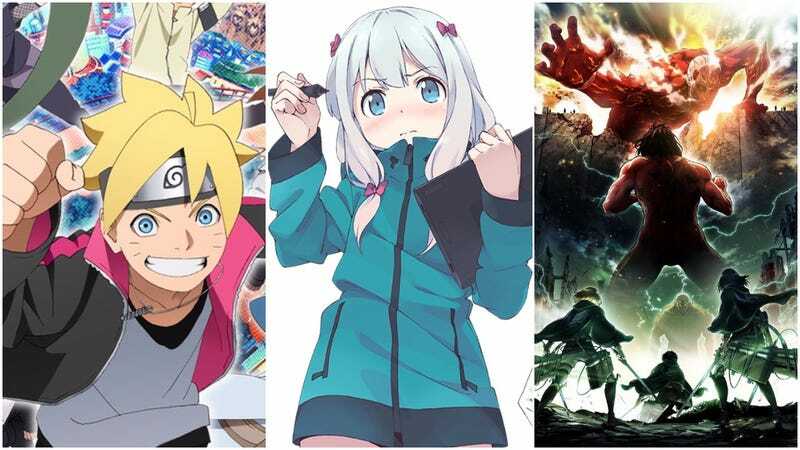 The spring anime season is upon us! Which shows do you want to watch? Let us know in the comments below. What It’s About in One Sentence: New idols-in-training join this latest Aikatsu season that features a new rival school that’s located on a cruise ship. What It’s About in One Sentence: A student at a prestigious magic school is miffed about a seemingly lazy teacher, who is actually a brilliant magician in his own right. What It’s About in One Sentence: A young prince spends his days playing smartphone games until the king tells him they need cash, sending the prince and his buddies on an intergalactic adventure. What It’s About in One Sentence: A young girl with supernatural abilities befriends an old man who might be able to help her. What It’s About in One Sentence: Even though Miao’s brother drives her crazy, he does care deeply about his little sister. What It’s About in One Sentence: A high school girl expresses herself through music as she reconnects with childhood friends. What It’s About in One Sentence: A hoodlum school boy is sent to a school disciplined by sword-carrying schoolgirls who whip him into shape. What It’s About in One Sentence: Set in the years before Astro Boy was created, two young researchers begin work on a robot with a heart. What It’s About in One Sentence: The battle between humans and people-eating Titans continues! What It’s About in One Sentence: The continuation of a saga following a mercenary swordsman as he struggles against his fraught past and fights for a way to make things right. What It’s About in One Sentence: This latest entry in the Beyblade anime, which follows the adventures of kids battling with spinning tops. What It’s About in One Sentence: Naruto’s son Boruto gets his own anime, following the adventures of him and his pals. What It’s About in One Sentence: This short Idolmaster anime follows the lives of idols. What It’s About in One Sentence: Set on an Earth that’s been revived through clockwork gears, a student in Kyoto has a sudden encounter with a busted automaton girl. What It’s About in One Sentence: Set in modern day Kyoto, this is the second season of an anime about shape-shifting tanuki, mythical Tengu, and humans. What It’s About in One Sentence: A docudrama-style anime that follows a swimmer driven by Olympic dreams. What It’s About in One Sentence: A high school student writes light novels that are illustrated by an ero manga sensei who turns out to be his little sister. What It’s About in One Sentence: Tales from Japanese folklore come to life in this anime aimed at small children. What It’s About in One Sentence: Kotobukiya’s Frame Arms Girl kits come to life in a high school girl’s room. What It’s About in One Sentence: The latest entry in the Buddy Fight card battle anime series. What It’s About in One Sentence: The massively popular smartphone game Granblue Fantasy gets a TV anime. What It’s About in One Sentence: A half-man beast longs to be human, and a young witch agrees to help him, but he has to help get back a stolen book first. What It’s About in One Sentence: Hinako moves to Tokyo to enter a high school with a theatrical troupe she’s always wanted to join. What It’s About in One Sentence: A school girl accidentally ends up as a crew member in space. What It’s About in One Sentence: A sixth grader tries to make her idol dreams a reality. What It’s About in One Sentence: A schoolboy creates a kabuki theater club at school and recruits other students to join. What It’s About in One Sentence: An airplane is engulfed by a mysterious structure and a pale man appears, saying he wants to play a part in Japan’s decisions. What It’s About in One Sentence: Hinako switches places with her twin brother, becoming the leader of a rough gang of delinquents. What It’s About in One Sentence: A sinister salesman fills the gaps in people’s hearts, but just don’t double cross him. What It’s About in One Sentence: Different rice varieties reborn as school boys try to become the most popular grain at their school, overtaking their rival, bread. What It’s About in One Sentence: A group of invaders wants to conquer Earth and ends up taking part time jobs during their quest. What It’s About in One Sentence: Set during the On Year War, a jazz-loving Federation squad member faces off against Zeon pilots who have robotic limbs and who are sworn to protect the Thunderbolt Sector. What It’s About in One Sentence: Monster Strike, the popular smartphone game, returns in anime form for a second season of monster battles. What It’s About in One Sentence: The further adventures of a boy who was given superpowers and then enrolls in a superhero academy. What It’s About in One Sentence: The latest entry in the anime about a young man who is able to see yokai and has a book of yokai friends (and enemies) his grandmother gave him. What It’s About in One Sentence: A short form anime starring feline versions of people from Japanese history like Ryoma Sakamoto. What It’s About in One Sentence: The short anime about a young ninja girl who works for powerful Japanese lord Oda Nobunaga is back! What It’s About in One Sentence: This short anime follows the crazy adventures of pigs who wear underpants. What It’s About in One Sentence: The second season of Rage of Bahamut, an anime about gods and demons possessing half of a key able to destroy the world and a young woman possessing the other half. What It’s About in One Sentence: Fictional characters are dragged into the real world and try to come to terms with everything that they knew was created by someone’s imagination. What It’s About in One Sentence: A high school student’s name is written in the “Kiss Note,” and unless he smooches someone in 24 hours, he will die. What It’s About in One Sentence: Another season of Rilu Rilu Fairilu, an anime about small key-carrying fairies known as Fairilu. What It’s About in One Sentence: The anime about a high school girl who can see spirits returns for a third season. What It’s About in One Sentence: With you as the protagonist, three anime dudes and three storylines unfold in your room. What It’s About in One Sentence: The best teacher in the land is summoned to the royal palace to tutor four challenging princes who have driven away previous tutors. What It’s About in One Sentence: The second season of an anime that follows an otaku and the girls he ropes in to help him make his own indie game. What It’s About in One Sentence: Some residents of a small town have special powers, and a girl and a boy join their powers to reset time and remember the past. What It’s About in One Sentence: A group of young women work to revitalize a small town that has seen better days, often to the chagrin of the locals. What It’s About in One Sentence: Lucifer, embodied as an anime girl, is tempted by the seven deadly sins, who are also anime girls. What It’s About in One Sentence: After humans are wiped out, it’s up to the Leprechauns (read: anime girls with colorful hair) to fight against beasty invaders until one day the last human appears. What It’s About in One Sentence: A student finds himself sucked into an online game in which a battle has been raging for a thousand years. What It’s About in One Sentence: Once again, this anime follows the adventures of a little boy and his pet seal. What It’s About in One Sentence: This is Level-5's amusing spin on Japanese role-playing games. What It’s About in One Sentence: Just because Kujo has become a Buddhist priest doesn’t mean he’s still not interested in more earthly matters. What It’s About in One Sentence: This anime centers around a group of high school boys in a prestigious music school. What It’s About in One Sentence: A sword princess and her cohorts battle monsters in a dungeon as she meets a young man and learns more about herself. What It’s About in One Sentence: Rescue vehicles transform into large mecha piloted by grade schoolers. What It’s About in One Sentence: A boy’s life changes when a mysterious girl in a kimono suddenly appears and shacks up in his room. What It’s About in One Sentence: The story of a young love between two middle school students, with the title referring to an old way of saying “I love you” in Japanese. What It’s About in One Sentence: Two junior high students battle evil as Angel Rose and Angel Sapphire, getting their marching orders from a hedgehog. What It’s About in One Sentence: Zany things happen at a local TV news station. What It’s About in One Sentence: Lurid tales of the supernatural and the unexplained, which might remind you of a Japanese Tales from the Crypt or The Twilight Zone. What It’s About in One Sentence: Starring a new duelist named Yusaku Fujiki, the Yu-Gi-Oh! VRAINS series will also feature VR Duels that take the show from high school to cyberspace. What It’s About in One Sentence: 100% Pascal Sensei is about one dumb teacher and his class.